There’s nothing like knowing what you want…not being able to find it…but knowing it’s got to be out there…somewhere. The time, the effort, the frustration (and the possible pulling out of some hair) is all worth it when, at last, success! Mark Pepke of European Stone Werks, in Memphis,Tennessee, knows the feeling. 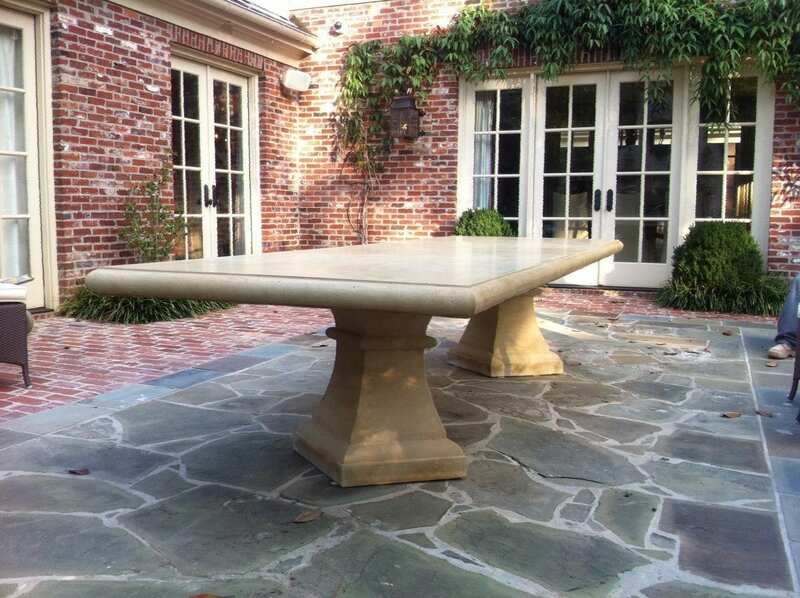 He was recently commissioned to create an expansive one piece custom table top for outdoor entertaining measuring 4’ x 12’, to be supported by only two cast limestone bases. So, Mark was on a mission to find a product that would not be too heavy, could make an 8’ span between bases, hold up to the elements, and could be manipulated to emulate cast limestone. After much research and many conversations, he was assured that SureCrete Design Products’ GFRC Xtreme Series mixes would fulfill his expectations. Confident with his choice and without a trial run, Mark headed straight into the custom concrete table top project. A mould was formed for the concrete table top and lined with Xtreme Series PreCast. For a comparable likeness to the cast limestone bases, the PreCast, with its ability to accept up to 20% aggregate, had an exclusive blend of sand and stain added to it. Xtreme Series Backer was packed behind the XS PreCast. The high density load of glass AR fibers contained in the Backer added structural integrity to the XS PreCast layer. This method also reduced the possible weight of the concrete table top: there is a 3½” profile, but it is only 2”thick in the middle. In this case, ladder wire was used in the Backer layer for additional reinforcement in this large concrete table top. The table was sealed and polished to a high shine. This first experience with SureCrete Products was a true success. Everything turned out as expected and without any glitches. Mark and his team were highly pleased with the results and have used the Xtreme Series for other projects as well. He looks forward to expanding his business utilizing the versatility of his new find!